This article was originally published by ecoRI News. Follow @ecoRInews to keep up on its invaluable reporting. Students from New York to Boston rallied May 3 with Brown Divest Coal activists on Brown University’s main green, demanding that President Christina Paxson and The Corporation of Brown University vote on whether to divest the college’s $2.5 billion endowment from the 15 largest coal companies in the United States during an upcoming May 23 meeting. Rally organizers provided the 150 attendees with symbolic orange ballots to cast into the “smokestack” of the ballot box, a miniature coal-powered plant made from a cardboard box with a big X on its side. A student from Tufts University voiced frustration that colleges with huge endowments are investing in the fossil-fuel industry. “Those investments are undercutting our ability to create a livable society," he said. Lucy Bates-Campbell, a Brown University senior, cast her ballot while cradling Roxy, her pet dog. Most animals will not be immune to climate change, Bates-Campbell said, so we need to help protect the animals that can’t protect themselves. Nick Katkevich, representing the University of Rhode Island’s new fossil fuel-divestment campaign, said his group will build capacity during the summer, then work with Brown and the Rhode Island School of Design to push for divestment on Rhode Island campuses next fall. URI’s campaign will be coordinated with students at Rhode Island College and Community College of Rhode Island, because all three schools share one endowment. The rally regularly broke into chants about climate change and divestment. Hand-painted cardboard signs were abundant. After casting their symbolic ballots, the students marched across the green to the administration building, where Paxson’s office is located. Two Brown Divest Coal representatives were sent to request that Paxson address the crowd; Paxson declined. Before the rally ended, Brown University junior Dara Illowsky held up a handmade sign with Paxson’s office telephone number painted on it. “I want you all to take out your phones and add this number to your contacts,” she said. Rally organizers asked each attendee to call the president soon and tell her their views about divesting from coal. On April 29, Divest RISD transformed from a relatively small college divestment movement to a high-profile campaign attracting attention from 350.org’s Bill McKibben and “This American Life’s” Ira Glass, who will feature the group on an upcoming program. As previously reported, Emma Beede, leader of Divest RISD, took a top-down approach when establishing RISD’s divestment campaign. Before rallying student support, Beede and a handful of student volunteers met with RISD’s faculty, administration and financial decision makers to introduce the concept of fossil-fuel divestment. After securing unanimous support from the faculty and experiencing opposition from the board of trustees, Beede began asking the student body to get involved. Despite what Beede described as “a lack of an activist culture at RISD,” Divest RISD has caught on among students. During Divest RISD’s April 29 Day of Action some 150 students gathered on the “RISD Beach,” between Waterman, Benefit and Angell streets, then marched to RISD’s administration downtown building on Washington Street. About and hour prior to the rally, Beede and 10 Divest RISD members marched into RISD President John Maeda’s office. According to Beede, Maeda wasn’t there, but the students informed his secretary that they wouldn’t leave the president’s office until the board of trustees agreed to hear Divest RISD’s case during its May 17 meeting. Beede said she and her fellow protestors then contacted the hundreds of people who signed the Divest RISD petition to bring attention to the sit-in and encourage them to join. The sit-in lasted 24 hours, during which the participants met with administrators and the president. After securing a chance to make the case for fossil-fuel divestment at the upcoming meeting, the protestors vacated the president’s office. RISD’s sit-in was the first of its kind for the fossil fuel-divestment movement that has been spreading throughout the country since last summer. At semester’s end, many leaders involved with campus divestment campaigns will graduate. Nathan Bishop of Brown Divest Coal graduates this month. He will move home to Chicago and start applying to law school. Bishop wants to work on climate-change policy and legislation. Bishop said he will stay involved with the fossil fuel-divestment movement. He plans to join Chicago’s divestment campaigns, and continue helping with Brown Divest Coal in some capacity. Beede, leader of Divest RISD, is also graduating. Beede’s future plans depend on where she finds a job, but she said she will continue to call for divestment regardless of her geographic location. She said she will get involved in local campaigns and continue to help with Divest RISD. According to student leaders from Brown, RISD and URI, each divestment campaign will concentrate on building capacity this summer. Jiang said she and others activists from Brown Divest Coal will attend a summer conference in New Jersey to learn and share strategies with other campus divestment campaigns. 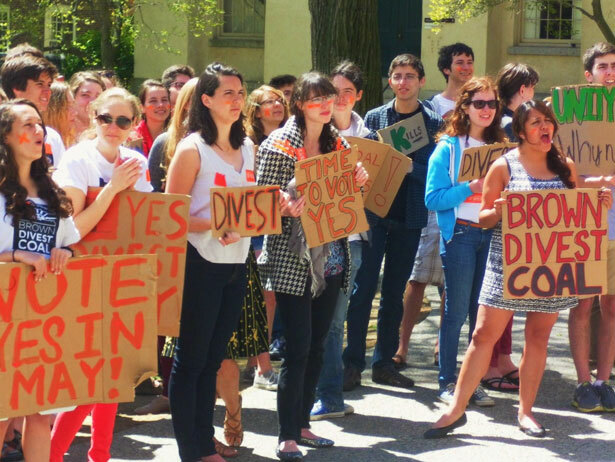 Brown Divest Coal activists expect The Corporation of Brown University to vote in favor of divestment from coal later this month, after which the campaign will expand its demands to include divesting from the rest of the fossil-fuel industry. Divest RISD activists will present at the May 17 board of trustees meeting. Divest RISD hopes to secure a vote from the board on divestment during its October meeting, according to Beede, who said Divest RISD has freshman, sophomores and juniors ready to continue the campaign after she graduates. Meanwhile, URI, CCRI and RIC’s campaign is in its fledgling stages, and will aim to gain traction during the fall semester. Stay tuned. Kevin ProftKevin Proft is a staffwriter for the ecoRI News.